I got this Pelikan M600 at a very good price buying from a fellow fountain pen lover. Though I got it used, it was kept in an excellent condition, I got the pen as good as new. The Pelikan M600 came in an EF nib which is the only nib that would work for me. 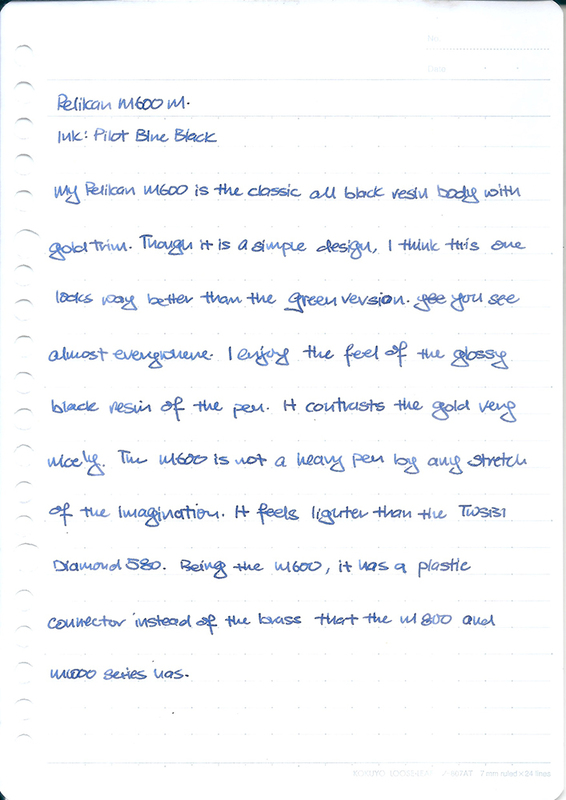 I have written about how the model number of Pelikan fountain pens work in a previous review. If you would like more information about that you can find it here. The Pelikan M600 came in the standard Pelikan brown box. Pulling the top section off and inside you will see the white faux leather pen sleeve. The pen sleeve is secured by an elastic band with a plastic tab with the Pelikan logo on it. The tab is trying to look like a wax seal on the sleeve. The box is a little too big and heavy overall, I rather they went with a more compact box. Though I must say I really liked the look and feel of the pen sleeve, but I still didn’t re-purpose it. 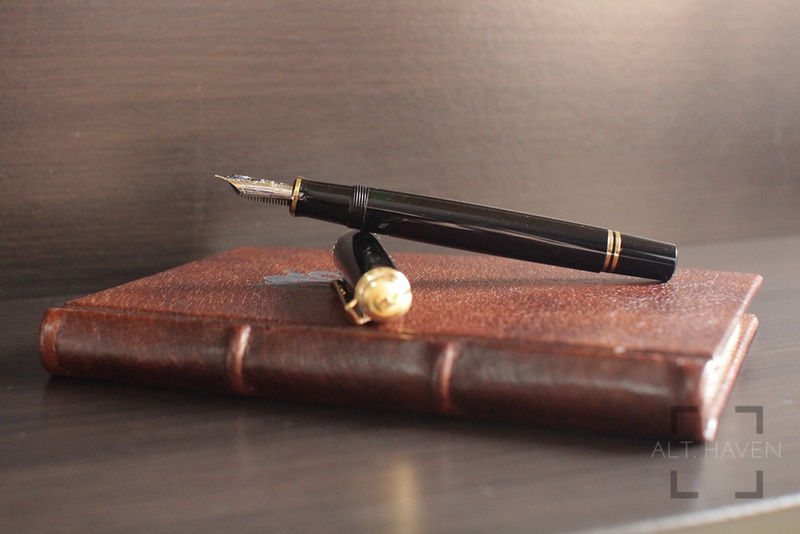 My Pelikan M600 is the classic all black resin body with gold trim. Though it is a simple design, I think this one looks better than the green version you see almost everywhere. I enjoy the feel of the glossy black resin of the pen. It contrasts the gold very nicely. The M600 is not a heavy pen by any stretch of the imagination. It feels lighter than the TWSBI 580. Being the M600, it has a plastic connector instead the brass one that the M800 and M1000 series has. The gold trim starts at the finial with the Pelikan logo. It then travels down the cap via the clip. Like all other Pelikan pens, it sports the trademark pelican beak clip. 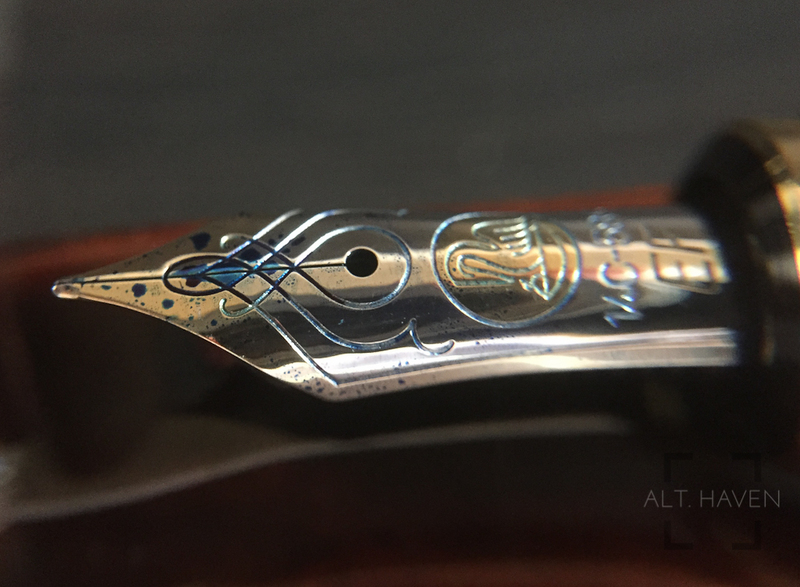 The gold centre band has the words “Pelikan Souveran Germany” etched into it. At the lip of the grip section, it has one gold band. Finally it ends with double gold band to mark where the piston knob begins. The gold clip is springy making it easy to slip over pockets and notebooks alike. Though it is springy, it is secure enough to hang onto what it is clipped to. It takes less than a full turn to get the cap off the pen. The cap is light and when posted to the pen, it doesn’t throw the balance off the M600. That said, I use the M600 un-posted as i do with all my pens. 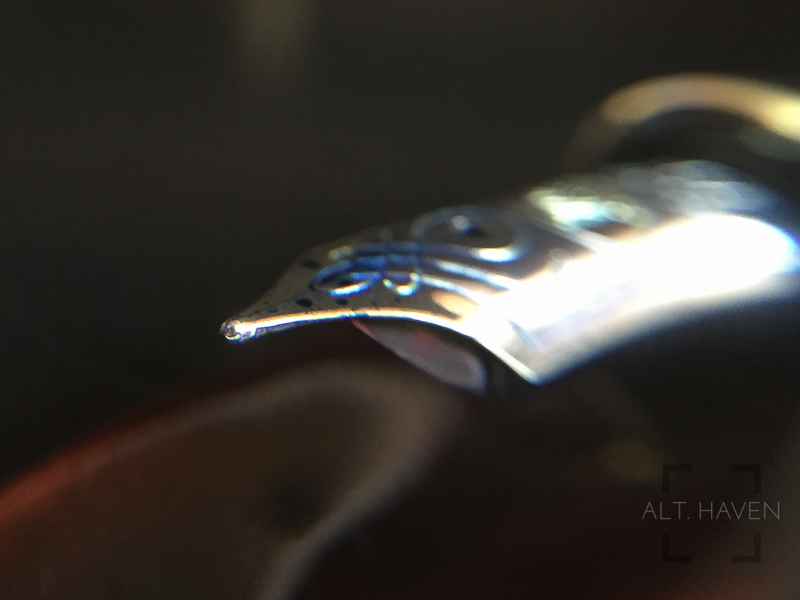 The grip section of the M600 is contoured, ending at the lip of the nib. I like the way the grip section is shaped. It guides your fingers to where they are supposed to go. The threads on the M600 is smoother and easily on the fingers than the M205’s. 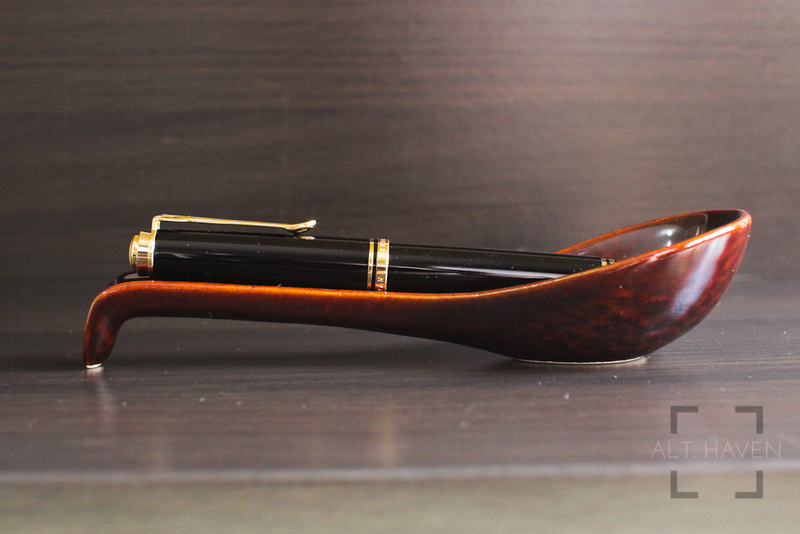 The M600 is a piston filler fountain pen. It has a large ink capacity especially when compared to a normal cartridge converter pen. In a piston filler fountain pen, the ink window is a vital part of the pen. Without it, there is no way to know how much ink is left in the pen, other than running out of ink. The green tinted ink window of the M600 is nice and large. All you have to do is to hold it against the light and it is easily seen. The piston works smoothly and is well lubricated. It has been working well since I started using it a few months ago. The nib the M600 came with is a 2 toned EF nib. Though it is an EF nib, it writes wet and board. It feels more like a M nib than an EF one. Pelikan nibs tend to be wetter and boarder than most brands. I really have no idea why it is the case but this is something to be aware of when buying Pelikan fountain pens. As board and wet the EF nib is, it writes with a little tiny bit of feedback. However, it is nothing that a little smoothening won’t fix. The nib is relatively stiff though it is a 14k gold, it doesn’t have the bounce or cushion you might associate with a gold nib. You can squeeze some line variation from it if you put your mind to it but why do that when there are nibs meant for flexing. The Pelikan M600 is a great size for my hand. I enjoyed the grip section of the M600 way more than the M205. I sold my M205 after I did the review. I had problems with the threads but the M600’s threads were much better. I guess you get what you pay for? I got this pen at a great deal. If I would to pay full retail price on this pen, I might balk. Yes, it is a great pen but there are many cheaper options around such as TWSBI. That said, Pelikan do not have the reputation of breaking parts.